David Herbert is that rarity: a purveyor of recipes in newspapers/magazines that are both enticing and accessible. I once bought a Gourmet magazine purely for the pastel fairy-spun macarons on its cover, and found the recipes inside so terrifyingly complex as to scare me off food mags ever since. There are a handful of places I’ll look to for recipes, and the most consistent of them is David Herbert in The Australian. He’s a beacon of simplicity in a world of increasingly show-offish gourmets and *shudder* “celebrity chefs”. Herbert champions quality ingredients and good taste, recipes both classic and from a range of cuisines. He isn’t afraid of fast, uncomplicated meals, even the occasional shortcut. His suite of recipes in the Weekend Australian Magazine is the first thing I turn to when I get to the Saturday papers. OK, the second thing after Mystic Medusa’s screwball horoscopes. I now have a pile of torn-out pages beside my bed waiting for their chance to be tested, and today I finally got the perfect opportunity to try his Coconut Fish Curry from a couple weeks ago. Late Friday night I arrived home from my waitressing job to find a scrawled note from Dad. “Going fishing at 7.30. If you want to come, vote 1” and then check boxes for my response. What could I say to such a proposition, reminiscent as it was of those notes passed in primary school?! Do you like me? Tick yes or no. Waking up is hard to do, though, particularly early on chilly autumn Saturday mornings. So I slept on, and by the time I’d surfaced, made some perfect porridge and attacked the weekend papers, Dad had arrived home with a haul of yellowbelly. Also known as golden perch, the sweet fresh flesh worked perfectly with the crunchy vegetables and subtle green curry spices. As well as the beans and tomatoes, I threw in some zucchini and snow peas I had lying around. Is it just me, or is it insanely pleasurable to have all your vegetables perfectly cut and ready to go when you start to make a curry or stirfry? Kaffir lime leaves proved impossible to find out here so I substituted the zest and juice of a lime and some fresh lemon basil from our garden, cut into fine ribbons. I also added quite a bit more brown sugar to balance out the saltiness – maybe the stock I used was too salty, or I should have gone easier on the fish sauce. I made a pot of brown rice to serve with this, starting the rice cooking in the absorption method just before I began my prep on the curry. Brown rice is so good for you and so much nuttier and tastier than white rice, as well as having a lovely texture. In all I was super happy with the results (as was my dad!) and I’d highly recommend this recipe. Heat oil in a large frypan or wok, stirfry shallots and garlic. Add curry paste and cook, stirring, until fragrant. 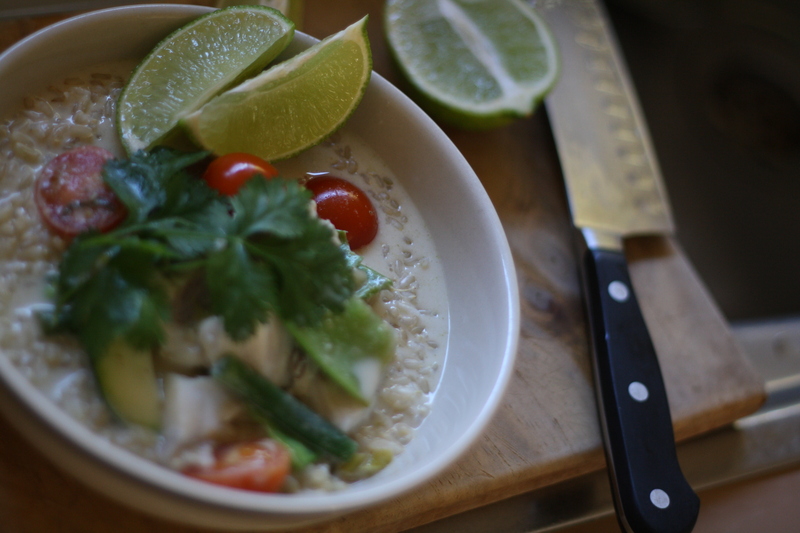 Add coconut milk, stock, fish sauce, sugar, lime leaves and tomatoes and bring to the boil. Simmer gently for about 10 minutes. Add fish and beans and simmer, covered, for about 5 more minutes or until the fish is just cooked. 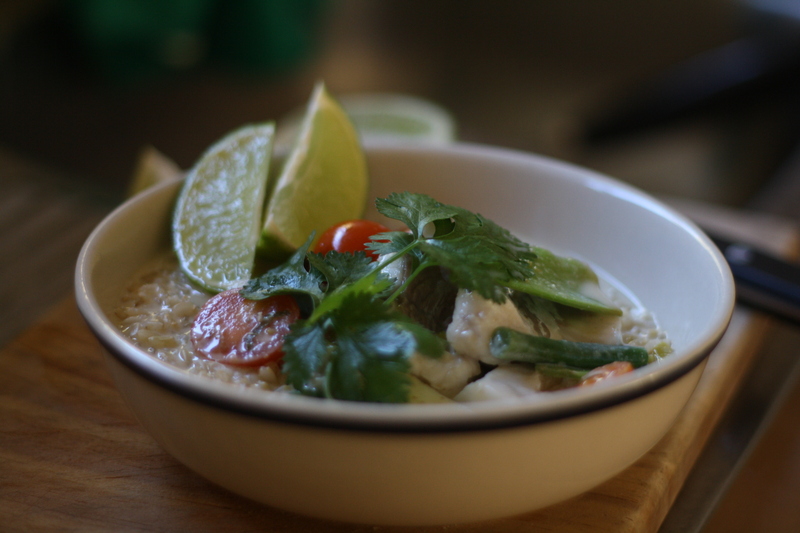 Serve with rice, topped with coriander and a lime wedge.